I slept badly and was awake before 07:00, so got up and had a shower to try to wake up. I packed my bags and checked out of the hotel then walked over to the meeting place at Intel. It was overcast and sprinkling lightly, getting heavier as I walked, but fortunately wasn’t quite heavy enough to be a problem. I got there at 08:00, so had some time to use the far superior Intel WiFi (compared to the flaky hotel one) before everyone arrived and we were led into the meeting room. The plenary session was basically just dull administrative stuff, lasting for about an hour and a half, concluding with the resolutions of thanks to the organisers, which provoked several rounds of applause. And with that the meeting was over and we were all free to say our good yes until next time and head home. Dietmar was driving a hire car straight to San Francisco Airport to catch a flight at 14:00, so I begged a lift off him so that I wouldn’t need to get to a Caltrain station and spend probably at least twice as long getting that far. From the airport, after Dietmar dropped me off at the rental car place, I caught Bart into San Francisco, getting off at Embarcadero. I tried dropping my luggage at the Hyatt Regency hotel, but the gu asked for my room number, and wouldn’t let me leave anything if I wasn’t staying at the hotel. 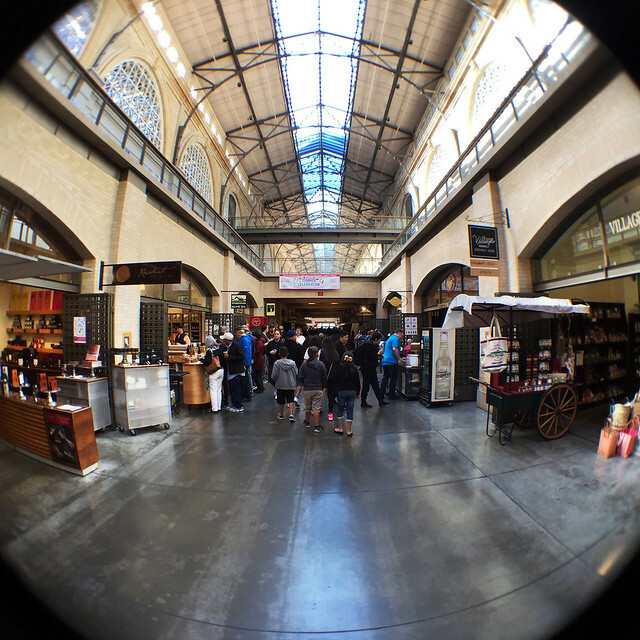 So I dragged my bags with me over to the Ferry Building. 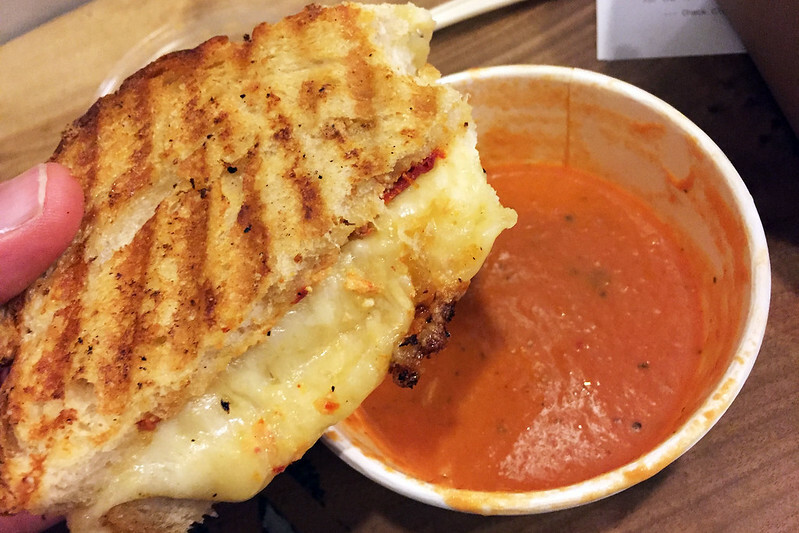 I was hungry for lunch, so got the grilled cheese sandwich of the day plus a tomato soup from Cowgirl Creamery. It was Cabot cheddar cheese with caramelised onions and maple mustard, and delicious as usual. 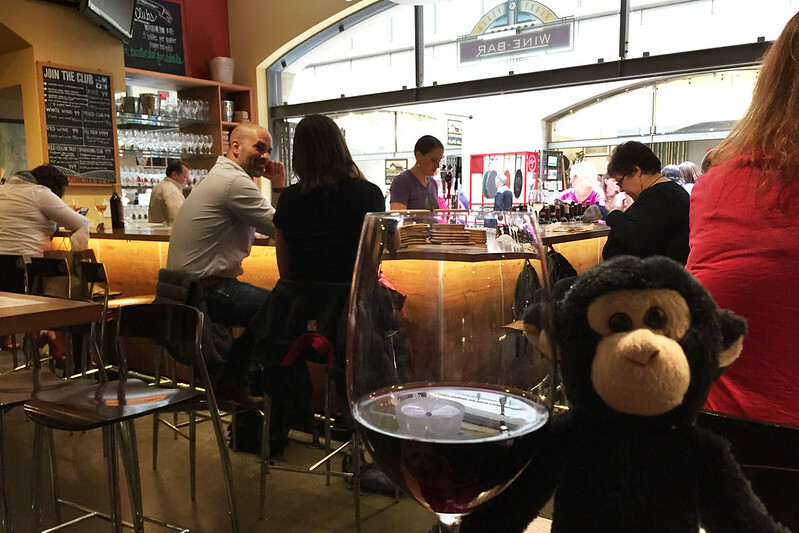 Then I walked over to the Ferry Plaza Wine Bar and grabbed a table to sit and write up this diary while enjoying a glass of wine. I first tried the 2014 Peay Vineyards Estate Chardonnay from the Sonoma Coast, feeling that would go well after the grilled cheese and tomato soup. It was okay. After sipping that away, I chose a 2014 Mauritson Zinfandel from Sonoma County. This was rich and delicious, with an aroma of dark black cherries soaked in brandy, and a long lingering taste of plums and warm spices, almost like a Christmas pudding. I’m wondering if there’s any way to get some back home, but Californian wine is very hard to find in Australia. After finishing the glasses of wine I went for a bit of a walk, and to use the toilets. I didn’t want to venture outside much because of the sun, so just walked slowly up and down the Ferry Building. I popped into the Book Passage book shop to browse for a bit, and got interested in a book about San Francisco called Cool Gray City of Love, with chapters about 49 different places in the city. It was a best selling book, and looked very interesting from a quick flip through. I decided to buy a copy to take home. Then I wandered over to the Humphry Slocombe ice cream place, resolved to get something sweet after the wine. The ice cream here is good, but they have a habit of only having weird flavours. Among the options today were Secret Breakfast (bourbon and corn flakes), Elvis – The Fat Years (peanut butter, banana, and bacon), Negroni, Rosé, something with coffee, Parallel Lines (brown sugar and white chocolate brownie), and a few others. Honestly, none particularly appealed to me, so I plumped for Peanut Butter Fudge Ripple, which was about the plainest option. It cost $4.50 for a tiny cup, so was very expensive. I took it outside to sit on a seat watching the ferries coming and going on the bay while I ate. Despite the sun it was chillingly cold with a biting breeze. The ice cream was okay, though I think I would have liked the Elvis one without the bacon better. Again, several people in front of me took tasting spoons of five or six different flavours before deciding on something, which I thought was very weird. Maybe I should have done the same to get more value for money. After finishing I moved back inside the Ferry Building and grabbed a table to sit in some shelter for a bit while I wrote some comic scripts. This turned out to be a futile endeavour, as I couldn’t concentrate. Instead I read some more chapters of Harry Potter and the Philosopher’s Stone on my iPad. 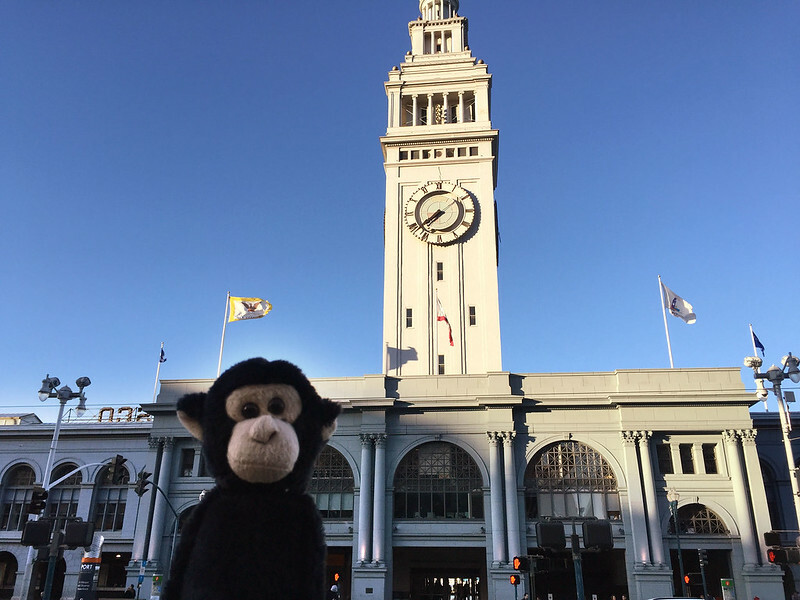 Eventually it was time to go and I headed back to Embarcadero station and took a Bart train to the airport. I checked in quickly thanks to my frequent flyer status allowing me to skip the queues and use the business class check in. I had a bulkhead seat this time, nearer the front of the plane. There was not much on the airside of security, so I found a power plug and charged my iPad while I chatted to M. via FaceTime on the airport WiFi. And then it was time to board. I sat next to a chatty guy who was from upstate New York, but had been living in Australia for four years. He said he didn’t want to go back to live in the USA because it was so terrible compared to Australia, and had just applied for permanent residency in Australia. After the meal, I shut my eyes and tried to doze for most of the flight. We landed in Sydney just after 07:00 on Sunday morning. I made it through the airport quickly and would have been home by 08:00 if not for the traffic leaving the airport, which slowed us down a good 15 minutes or so. I got home a bit after 08:00, another trip done! This entry was posted on Saturday, 17 June, 2017 at 11:31	and is filed under Diary. You can follow any responses to this entry through the RSS 2.0 feed. You can skip to the end and leave a response. Pinging is currently not allowed.